By 2016, Inside Oncology’s new market intelligence report: Academic Cancer Centers (NCCC): Trends Impacting Key Account Management is predicting that the majority of patients with cancer will not be treated at private community oncology practices, but at Integrated Delivery Networks (IDNs) and cancer institutions. Supporting this prediction, Community Oncology Alliance notes in its 2012 Trends Report that 50% of reporting community oncology practices have closed or been acquired/managed by a hospital. This trend is being driven by a “perfect storm” of forces that is making hospital based care more profitable than private community care. 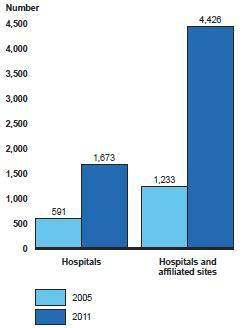 Five years ago, the generally accepted split between communities versus hospital site of care was 80:20, respectively. Today, based on its research (fig.1), Inside Oncology estimates that ratio to be 50:50; and predicts an even greater shift to 40:60 private community practice versus IDNs/Cancer Institutions. Independent community oncology practices are struggling to remain profitable from the burden of increasing costs and falling reimbursement rates. Since the inception of ASP +6% reimbursement by Medicare, revenue for community practices has shrunk dramatically. Prior to ASP +6%, margins for Medicare Part B administered drugs were considered the largest source of income for practices. These profits enabled patients to conveniently obtain care in virtually every neighborhood. Moreover, these profits often allowed community practices to absorb the cost of treating patients without insurance or who had difficulty making their co-payments. With the loss of these profits, community oncologists can no longer tolerate any financial risk and send uninsured, under-insured, and indigent patients to hospitals for care. What’s more, many small neighborhood practices have merged into large group practices and state-wide “super” group practices in order to achieve cost efficiencies and remain profitable. Adding to their burden are CMS’s quality reporting, implementation of electronic health records (EHR), and e-prescribing. In prior years, CMS provided incentives to off-set part of the cost of these programs but the incentives are disappearing and penalties for non-compliance with these programs are now being implemented. Practices that postponed EHR implementation and quality reporting are being hit with a tsunami of new costs and penalties. Hospitals, academic cancer centers, and IDNs are focused on increasing capacity by expanding their treatment sites, and view private community oncology practices as the perfect business opportunity. The 340B Drug Pricing Program and its expansion through the Patient Portability and Affordable Care Act (PPACA) aka “Obamacare” has created a huge revenue opportunity for hospitals that qualify. It has been estimated that drug discounts of 20%-50% are achieved by 340B participation and the number of qualifying hospitals and their affiliated sites has tripled since 2005 to almost 6,000 in 2011. PPACA also allowed the Prospective Payment System (PPS) exempt cancer centers (e.g. MD Anderson, MSKCC, Dana Farber, etc) to be eligible for the program. Inside Oncology reports in its research that hospitals are actively acquiring community oncology practices and obtaining full reimbursement for drugs acquired at 340B discounted prices for all patients, including those with private insurance. All perfectly legal as long as the treatment center or IDN qualifies for 340B and that the patients being treated belong to the qualifying entity. Some oncology manufacturers have begun to actively engage centers who participate in the 340B program to ensure that the centers stay in compliance with its requirements. This also ensures that qualifying accounts understand the program and are not at risk of disqualification from unintentional abuse (i.e. drug diversion to patients not under the care of the IDN or cancer centers double-dipping: obtaining an additional Medicaid rebate for drugs purchased under 340B). Cancer institutions and IDNs may also be better equipped and staffed to meet the new CMS quality and performance reporting requirements. If effectively managed, cost reduction and quality programs (e.g. ACOs, value-based purchasing) present opportunities for hospitals to increase revenue. As the proportion of sales coming from cancer institutions and IDNs increases, pharmaceutical manufacturers need to become more adept at managing these key accounts and the new emerging decision makers involved in cost and quality programs (e.g. CFO, Quality Directors). Pharmaceutical marketing and sales leaders need to keep abreast of these changes and adapt to the new needs and growing importance of the IDN/Cancer Institution market segment. The traditional sales and marketing approach to these accounts is no longer effective, and leading oncology companies are responding with novel account management strategies. More information about these trends and how pharmaceutical companies are adapting to them is available from Inside Oncology and their new report – Academic Cancer Centers (NCCC): Trends Impacting Key Account Management. David Guy and Sheila Rodgers are Managing Partners of Inside Oncology LLC (InsideOnc.com) a consulting and market research company focused on supporting the commercialization efforts of oncology product developers and manufacturers. They can be reached at info@InsideOnc.com or 1.858.367.0512.